Trees , to 41 m. Leaves : stipules linear-lanceolate, 3-4 mm, early deciduous, leaving 2 stipular scars adaxially near base of petiole; petioles (44-)60-100(-150) mm. Leaf blade palmately lobed, main lobes sometimes again dentate-lobed, 7-19(-25) × 4.4-16 cm; surfaces glabrous, except young leaves hairy on veins and main vein-axils at base with persistent reddish brown simple hairs. Staminate flowers in pedunculate clusters, 3-6 cm; perianth absent; stamens 4-8(-10) per flower, 150-176(-300) per cluster, falling after anthesis. Pistillate flowers without perianth; hypanthium disclike, with 5-8 staminodes around cycle of disc lobes; ovary (1-)2-locular; styles 2; stigmas introrsely curved. Capsular heads brown at maturity, globose, 2.5-4 cm diam. (including indurate styles). Seeds apically winged, 8-10 mm, marked with resin ducts; aborted seeds brownish, 1-2 mm, unwinged, irregular, resembling sawdust. 2 n = 32. Flowering spring (Mar-May). Fields, woodlands, flood plains, low hammocks, swamps, riverbanks; 0-800 m; Ala., Ark., Conn., Del., D.C., Fla., Ga., Ill., Ind., Ky., La., Md., Miss., Mo., N.J., N.Y., N.C., Ohio, Okla., Pa., S.C., Tenn., Tex., Va., W.Va.; Mexico; Central America (Belize and Honduras to Nicaragua). The leaves of Liquidambar styraciflua , fragrant when bruised, turn deep red to crimson in autumn. Although leaf variation is common in L . styraciflua , this deviation is randomly distributed and without any definable geographic correlation. Liquidambar styraciflua is often cultivated; a number of cultivars have been introduced in cultivation. 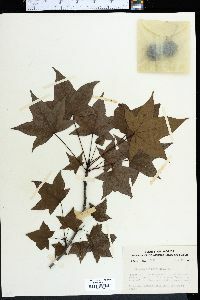 Liquidambar styraciflua was well known as a medicinal plant by Native Americans. Cherokee, Choctaw, Houma, Koasati, and Rappahannock tribes used it in various ways, especially the gum, bark, and root, as an antidiarrheal, dermatological aid, gynecological aid, sedative, febrifuge, and for related uses (D. E. Moerman 1986). Liquidambar styraciflua produces a balsamic oleo-resin called American styrax or storax, a thick, clear, brownish yellow, semisolid or solid with a pronounced aromatic odor. It is chewed as a sweet, natural gum. The balsam is collected from the inner bark of the tree after wounding or deliberate gashing. It is used in soaps and cosmetics, as a fixative in perfumes, adhesives, lacquers, and incense, and as a flavoring in tobacco. The wood is used for cabinet making, furniture, veneer, interior finish, barrels, and wooden dishes. Medicinally the gum has been used for catarrh, coughs, dysentery, sores, and wounds of both humans and domestic animals. The largest known tree of Liquidambar styraciflua , 41.4 m in height with a trunk diameter of 2.25 m, is recorded from Craven County, North Carolina (American Forestry Association 1994). Tree 12 - 22 m tall, trunk 30 - 45 cm in diameter Leaves: alternate, stalked, shiny bright green above, pale beneath, 8 - 15 cm long, star-shaped with five to seven pointed lobes and a nearly square base, finely toothed, with tufts of hairs at vein axils. 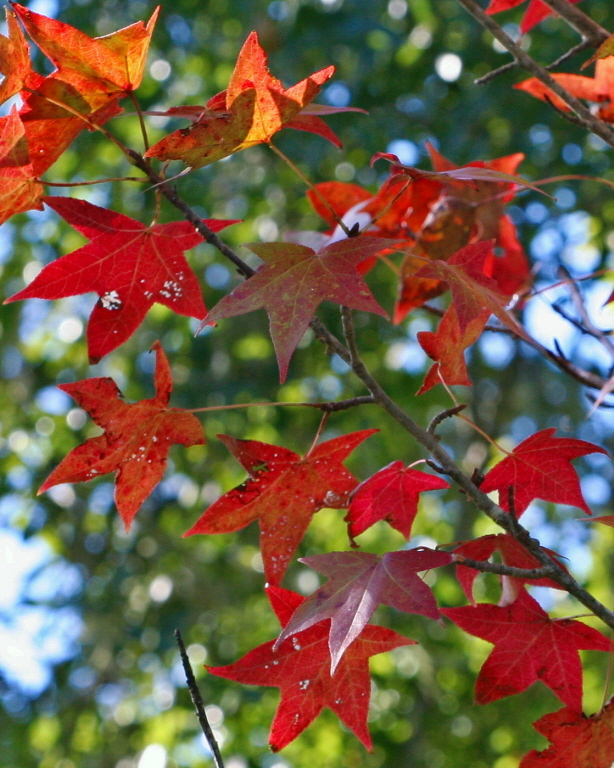 Leaves turn yellow, orange, red, or purple in fall. Flowers: either male or female, found on the same plant (monoecious), male flowers borne in small clusters along an upright stalk, female flowers in a spherical cluster at end of stalk. Fruit: a spherical aggregate of two-beaked capsules, long-stalked, 4 cm in diameter. Capsules are dark brown, woody, contain two winged seeds, and persist into winter. Bark: gray to grayish brown, corky, deeply furrowed with narrow, scaly ridges. Twigs: green, changing to yellowish or reddish brown with corky wings, aromatic when scratched. Buds: reddish brown, 6 - 12 mm long, egg-shaped to conical, slightly sticky, may be aromatic when crushed. Form: conical, becoming rounded with age. Similar species: Liquidambar styraciflua rarely grows spontaneously in the Chicago Region. It is simple to identify by its conical form, twigs with corky wings, spherical aggregate of capsules and star-shaped leaves with yellow, orange, red or purple fall color. Habitat and ecology: This species was introduced from the south and rarely grows spontaneously in the Chicago Region. It has been found in poorly drained mesic woods, along creeks, and in bottomlands. Liquidambar styraciflua tolerates poorly drained soil and periodic flooding but is not tolerant of shade. Notes: Wood of this species is used as veneer for plywood panels, furniture, and cabinets. The gummy sap was used during World Wars I and II for making soap, drugs, and adhesives. Cultivars of the species are planted in the landscape. Etymology: Liquidambar comes from the Latin words meaning "liquid amber," referring to the liquid resin found in the bark of L. orientalis. Styraciflua means "flowing with gum," which refers to its sweet, gummy sap. Restricted to low woods in the southern half of the state. Where it is found, it is usually a frequent to common tree and associated with American beech, pin oak, American elm, river birch, and red maple. Also known as red gum by foresters and in commerce. Tall tree, the smaller branches often with broad, corky wings; lvs long-petioled, rotund to reniform in outline, deeply 5-lobed, the lobes divergent, triangular, finely serrate; staminate infl 5-10 cm; mature pistillate heads brown, 3-4 cm thick including the indurate styles; 2n=32. Moist or wet woods; Conn. to s. O., s. Ill. and Okla., s. to Fla. and Guatemala. May.